Earn 4.2 SB per $ when you buy Papa John's gift cards at MyGiftCardsPlus, powered by Swagbucks. Take the guesswork out of gift giving. A Papa JohnÃ¢â‚¬â„¢s Gift Card can be given to anyone who loves great tasting pizza! It is the perfect gift for those Ã¢â‚¬Å“hard to buy forÃ¢â‚¬Â? people on your shopping list. 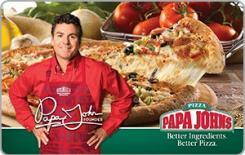 Papa JohnÃ¢â‚¬â„¢s operates and franchises more than 3,000 delivery and carryout pizza restaurants worldwide. Papa John's eGift cards are ONLY redeemable at US store locations.